Deuteration is used in solid-state NMR of proteins to reduce both homonuclear (1H-1H) and heteronuclear (1H-13C and 1H-15N) dipolar interactions. This improves resolution and reduces the magnitude of RF decoupling needed, enabling 1H-detected experiments even in rigid solids. The deuterium spins contain additional information, as the quadrupole interaction has been shown to be a measure of local order and sample mobility in both solid-state and solution-state NMR. This has been used to determine order and dynamics in a variety of liquid crystals, structurally interesting lipids, and biologically interesting membranes. More specifically, 2H NMR has served as a useful probe of the perturbation in (deuterated) membranes resulting from the binding of peptides or proteins, and of the alignment of (deuterated) peptide bonds and planes relative to the bilayer normal. A four-channel (1H/13C/2H/15N) probe is therefore a useful instrument for solid-state NMR of proteins. 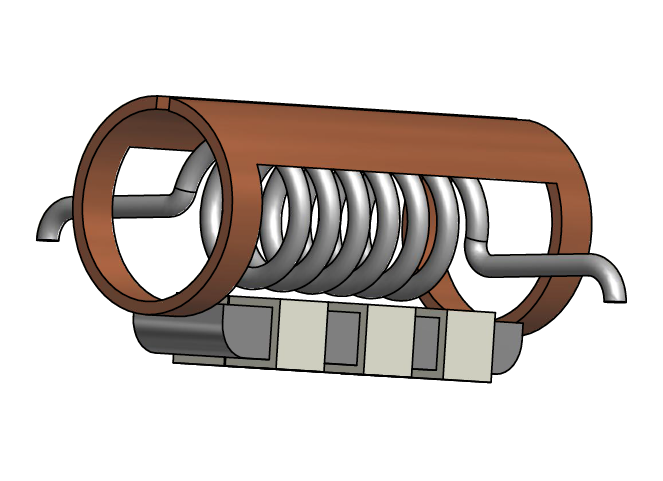 This probe design incorporates a coaxial coil arrangement with an outer modified Alderman-Grant resonator (for 1H) and inner solenoid (for 13C/2H/15N). The low inductance of the resonator minimizes sample heating during high-power proton decoupling. 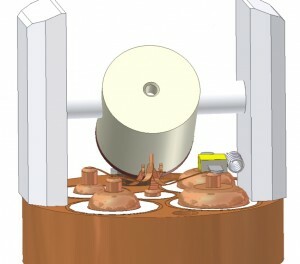 The probe utilizes transmission line segments as tuneable reactances.